Since 2010 I have been working in government relations for the General Atomics Company of San Diego. 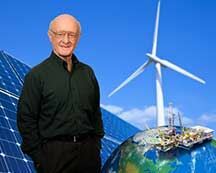 But I have been involved with energy, economics and environment issues since 1970 when I took MIT Economics Professor Morris A. Adelman's energy economics course as a graduate student. It was quite a revelation to me when I realized that how we should think about resource supplies is as much, if not more, a function of economics rather than geology. I came to understand that it is simply a fact that all we know about a given resource is always a function of the technology available at any given time, the luck society has had exploring for that resource, plus the economics of further exploring and developing that resource. Before that, I had started my Ph.D. thesis on the economics of alternative reliability levels for electric generation systems, in large part, because I thought that essentially no work had been done in the field since the 1930's, and I sensed that the underlying reality had changed sufficiently that there were many interesting issues to be explored. My thesis committee included faculty from the electrical engineering department along with others from the Sloan School of Management. After I earned my Ph.D. in 1973, I won a new fellowship from the American Association for the Advancement of Science (AAAS) to work in the US Congress for a year, where I joined the US Senate Energy Committee. It was a momentous energy year because the Arab Oil Embargo began only 6 weeks after I arrived in DC. The following Congress was nearly as interesting, so I decided to stay to learn a bit about the House of Representatives, and was hired by the new US House Budget Committee to do its energy work. After President Carter decided to make energy legislation his first important legislative initiative, Speaker Tip O'Neill (D-MA) created the ad hoc Committee on Energy to enact broad energy legislation responding to Carter's initiative. I was asked to staff the Chairman of that committee, Cong. Thomas Ludlow "Lud" Ashley of Toledo, Ohio. It was a fascinating assignment - the issues were analytically interesting, the politics extremely complicated, and the personalities fascinating. I had never had to deal with such an assortment of issues and people, and had to learn the art of compromise while doing your best to adhere to principle. I worked for the House Budget Committee for 20 years, adding the responsibility for reviewing NASA programs, and oversight of the overall Federal R&D Budget. In 1995 I joined the US Department of Energy, where I had the privilege of working for Under Secretary Charles Curtis, for whom I staffed budget, science and certain energy policy issues. In 1997 I was nominated by President Clinton, and confirmed by the US Senate, to serve as the CFO for the Department of Energy. I served Secretaries Federico Pena and Bill Richardson, and stayed on to serve Secretary Spencer Abraham in the Bush Administration. After retiring from federal service, I later joined the University of California, in its DC office, to serve as its energy and science advisor with oversight of its National Laboratories - Los Alamos, Livermore and Berkeley. I have been very fortunate in my career to work for very interesting, intelligent and capable people, while handling extremely complex issues that put me in a position to contribute to public policy. In 1973, when I joined the congressional staff, non-market criteria (which were the legacy of legislation from the 1930's and economy-wide price controls imposed in 1971), were used to allocate natural gas, oil and electricity supplies; I would like to think I contributed to forming the consensus that markets needed to be at the center of those processes. I also contributed to building the U.S. Strategic Petroleum Reserve, and to obtaining funding for important DOE programs, among them many of those in the DOE Office of Science. It is most important to understand that there are many energy industries, not one "energy industry." Their work is complicated by the fact that all of them are heavily, and I would say unavoidably, affected by public policies designed to accomplish many, often conflicting, objectives. The challenges faced by electric utilities in a mostly deregulated world are quite different than those faced by the oil and gas industry. In turn, oil companies (refiners also have different interests than upstream companies) face challenges that are quite different than those faced by gas production or distribution companies. To me, one of the more important issues facing the electric industry, is what public policies are necessary to ensure that it remains sufficiently reliable, i.e., who pays (and why should they pay) for the surplus capacity needed to keep it reliable. The oil and gas industry needs to learn how to do business in an age of relative abundance, rather than scarcity, while governments learn new, and hopefully productive and efficient ways to address their legitimate environmental and national security concerns. I served as the General Chairman of the first annual conference of the IAEE in June of 1979 that was held in Washington, D.C. and joined the NCAC at that time. I later served on the NCAC Council for a number of years. My most vivid memory was when I arranged for an old friend, John Treat, to speak to the NCAC in 1981, just after he arranged for the NYMEX, which he was President of, to trade oil futures contracts. Interestingly, most people believed these contracts would fail because OPEC nations would never allow these contracts to diminish any of their pricing power. But, economic realities have a way of asserting themselves, and the rest is history. In my experience, NCAC and the IAEE are at their best when they bring these kinds of cutting-edge ideas into the light. In the early days of the NCAC and the IAEE there were many opportunities to question long-held nostrums such as the then-accepted "facts" that the U.S. was "running out" of oil and natural gas. I hope the IAEE continues to keep its edge, while serving as an objective forum where academics, government and industry can continue to discuss and elucidate these issues. I am CEO of Powerhouse. We offer clients the Power of Price Protection, using futures markets to hedge exposure to price volatility. Powerhouse represents the most recent venue in which I've worked. I began my career in energy economics in February, 1969. (The business was called Oil and Gas then. Things like solar and wind power and biofuels were generally viewed with bemused detachment.) I worked for Walter J. Levy Consulting in New York City focusing on geopolitical implications of actions in the (mostly) oil business. I came to Washington, DC in 1976 and affiliated serially with several energy consultancies. I remember them mostly as sets of initials. Even my own business, Energy Futures Group was known as EFG. EFG was a real turning point for me; I became involved with the commodities business through my then-client, the New York Mercantile Exchange. I have been a licensed commodities broker since 1982, focusing on the challenges faced by businessmen dealing with highly volatile energy prices. The world of energy has undergone radical change since 1969. It's been a privilege to have seen so much of that change. Specifically, I was part of the team that developed the first successful energy futures contract in 1977. This created transparency in pricing that is the rule today. It was a real game-changer for the world economy. Oil markets have experienced declining volatility. Complacency has become the order of the day as the United States tastes the benefits of energy independence. Markets are never permanently active or quiet. Some event will move prices but the direction is not clear. The position of the United States in global geopolitics if and when exports of crude oil are allowed is emerging. Renewable fuels are becoming an integral part of the fuel mix. I am an original member of NCAC and the second President of the chapter. (Fred Abel was the first.) I was very active until I became a commodities broker. Energy futures markets open through the day put a damper on my ability to attend monthly events. More recently, I have been able to come more frequently. One memory I'd like to share relates to the value of participation. NCAC decided to sponsor an essay contest that carried a cash prize. This was in the late 1980's. I volunteered to develop a list of Washington area colleges where we would promote the contest. In the course of building the list, I came across Marymount College in Arlington. Marymount required its graduates to serve an internship. And while I was looking for essayists, Marymount was interested in placing interns. Marymount introduced me to Elaine Levin who started to work for me in 1989. Elaine has been my partner ever since and is today the President of Powerhouse. It has been a successful relationship. This would not have happened without my participation in NCAC. In the profile below, Shirley talks about her experience in the energy/environment arena and shares several of her past achievements including her leadership roles with NCAC/USAEE. In 1992, Lorraine Cross and Len Levine talked me into being secretary of the NCAC which launched my serious involvement in the organization. (Putting out the newsletter involved mailing labels and rolls of stamps). One my most memorable early NCAC events was the annual dinner when Bob Ebel shared details of his recent visit with the oil "industry" in the newly post-Soviet Russia. When I joined the staff of the Senate Energy and Natural Resources Committee in 1993, I relied heavily on my connections - and phone directories - from the NCAC and the USAEE/IAEE. The first week, Chairman Johnston asked me to put together some alternatives to the Clinton Administration's proposed Btu tax which had just passed the House. He knew the votes weren't there for Senate passage. I had to input data from various EIA reports to do the analysis. Glenn Schleede came to my rescue by providing a floppy disk with some of the files I needed. Many other colleagues from NCAC/IAEE were invaluable, and patient, taking my many phone calls, John Jimison, Mike Canes and Adam Sieminski to name a few. The NCAC meetings themselves, as well as the professional relationships developed through the organization, were invaluable as I worked mostly with lawyers on the Hill. In fact, that professional encouragement I received in the NCAC/USAEE/IAEE organization, led to my priority as Councilmember, President and Senior Fellow of the USAEE to expand the student programs and networking opportunities for young professionals. I spent nearly eight years working on the full range of energy policy issues in the Senate, from upstream oil and gas matters to being lead staff negotiator on passage of a federal renewable portfolio standard. When I left the Senate, I taught an energy policy class at the School of International and Public Affairs (SIPA) at Columbia University for several years. By that time, the conversation on energy policy and economic analysis in the U.S. was moving beyond the regulatory approach with administrative oversight to an increasing emphasis on incentives for restructured markets supplemented with performance standards for vehicles and equipment. Technological advances across the sector from production to network systems and user applications, coupled with the awareness of the climate challenge, have further shifted the focus to reliability and resilience. I think the challenges today continue in that vein with the added awareness of cybersecurity. In 1995, the year I was president of the NCAC, the Congress passed legislation to lift the export ban on Alaska North Slope crude. Nearly 20 years later, the Chair and Ranking Member of the Senate Energy and Natural Resources Committee are asking EIA for an analysis of the potential impact of allowing exports of any domestic crude oil. And, the biggest impediment to continuing the expansion of renewable power is the flattening demand for electricity due to efficiency improvements. I am currently the President of two companies that I founded after I retired from the Federal government following 30 years of service. In 2008, I began Cogent Analysis Group, a consultancy in the energy and environment area. Cogent Analysis consults for governments including Indian tribes and for both for- profit and not for-profit entities. In 2012, I began Cogent Energy Services, Inc., a firm established to design, test, construct and deliver compact, modular plasma-based waste-to-energy systems suitable for distributed generation scenarios. The system is expected to economically convert one ton of average energy content municipal solid waste into almost one MW of net electricity. My firm has begun building its first unit. I have been working in the energy and environment areas since 1976 when I taught the first Environmental Economics course offered at the State University of New York at Buffalo. This was followed by 12 years at the Department of the Interior where I was intimately involved in land management including wilderness designation, oil and gas leasing and operations both on- and off-shore, and royalty management, among other energy and environmental areas. I left Interior and joined DOE for the next 12 years where I held numerous positions including Chief Economist, Deputy Assistant Secretary for Energy, Environment and Economic Policy Analysis in the Office of Policy and International Affairs, and Chief Operating Officer and Deputy Assistant Secretary for Planning, Budget and Management in the Office of Energy Efficiency And Renewable Energy (EERE). Through these positions I had the opportunity to be at the fore in the development of the 1991 National Energy Strategy, the 1993 BTU tax, the first Clinton-Gore Climate Action Plan, the negotiations leading to the Kyoto Protocol (especially the cap and trade and CDM portions), and the many advances in energy efficiency and renewable energy. In 2002, I returned to Interior for six more years as the Department's Assistant Deputy Secretary. In that role, among many other responsibilities, I led its efforts in land and water management in response to climate change. Many of the recommendations coming from this work were included in Interior's strategy promulgated by Secretary Salazar in late 2009. Finally, I am very proud to be on the Board of Directors of the Alice Ferguson Foundation, an environmental education foundation located in Accokeek, MD, on the banks of the Potomac River. The Foundation is in the process of building a facility that will meet the "Living Building Challenge," (zero energy, zero waste, and zero water among other very stringent requirements) of which there are only 3 facilities currently in the United States. I was recognized by both President Clinton and President Bush for my leadership in the energy and environment arenas by awarding me the Presidential Rank of Distinguished Executive. Further, gold leadership awards from Secretaries of the Interior and of Energy recognized my achievements in both areas. I would also note here my three year Chairmanship of the Climate Technology Initiative created by the OECD members of the UNFCCC. I was the Chair during a critical period for the credibility and survival of this Initiative. I am proud to state that it still exists today and continues to contribute significantly to the process of technology transfer, in general, and the UNFCCC process, in specific. There clearly are many. Let me cite just two. First, maintaining and enhancing the infrastructure needed to transmit electricity, natural gas and oil is critical and I'm glad to see the Quadrennial Review taking this on. I'm a proponent of identifying opportunities for distributed generation as part of the solution. Second, is the growing threat of climate change. While at DOE I focused solely on the mitigation of greenhouse gases while at Interior, which is responsible for one in every five acres of land in the United States and a third of the water in the West, I focused on adaptation/resilience. It is paramount that both be indispensable parts of the nation's approach to the climate change issue. Addressing these two issues is part of why I am so excited about the small scale plasma-based waste-to-energy system my company is developing. By using renewable waste as a feedstock and thereby reducing the volume of waste that ends up in a land fill (and becomes methane) by 98-99 percent, and by developing it at a small scale that is widely applicable to distributed generation, the system we are developing contributes to solving aspects of both issues. I joined the IAEE and the USAEE in 1990. I finally had the time to be a more active "attender" of NCAC events once I retired from Federal Service in 2008. I find that the NCAC lunches tend to meld together in my mind and in a very good way. Consistently, the attendees are great and interesting. The presentations are always top-notch, and I always learn something. Most importantly, it keeps me feeling connected to the Washington energy community. I think the reason for being (and becoming) a member is that feeling of community, of belonging to an organization, to a network of like-interested colleagues (though not necessarily like-minded - which is part of what makes things interesting) of all ages. I admit that having a wide age distribution makes NCAC events more interesting. It gives perspective. I enjoy talking with members at the beginning of their careers, those in the middle and those who are my career-point peers. NCAC helps keeps energy fresh. I have been in the energy industry my entire career. After studying geological sciences in college, I started out as a well-logger with an oil field service company evaluating oil and gas wells in the Denver-Julesburg Basin. I then returned to school for a finance degree and, upon graduation, took a position with a management consulting firm, focusing on oil and gas exploration and production companies, natural gas pipelines and distribution companies, and electric utilities. Subsequently, I worked for the Columbia Energy Group and served in a variety of finance positions related to cogeneration project development, energy marketing and mergers and acquisitions. While at Columbia, I obtained the Chartered Financial Analyst (CFA) designation. I then joined Pepco Energy Services (PES), where I served as a senior vice president and chief financial officer for nine years. Five years ago my partner and I started Avalon Energy Services, which provides a variety of energy consulting services related to energy procurement, combined heat and power and onsite power project economic due diligence, wholesale supply and credit support agreements, and the development and implementation of energy conservation measures. The energy industry is what I know and love and there is no other place I would rather be. While at PES, I was fortunate to be part of a management team that grew the company's annual revenue from $180 million to $2.2 billion and became the Mid-Atlantic's largest competitive retail energy provider. It was quite a ride. At Avalon Energy, we have had a great deal of success assisting commercial customers in managing their electricity and natural gas strategies and costs. There are many products available in the competitive markets and we have been able to help our customers choose those that best fit their needs and, through reverse auctions, obtain significant dollar savings as well as favorable terms and conditions. We serve a variety of businesses including office building owners and property managers, labs, manufacturers and retail establishments, just as a few examples. We recently completed natural gas and electricity procurement assignments for the District of Columbia government and their portfolio of buildings. More and more often, customers are asking for assistance with green energy strategies. There is an increasing societal sense of pessimism that we need to overcome. Pick up the newspaper on most days and it seems we are destroying the earth, running out of resources, and traveling down a path to our demise. I am not downplaying the challenges we face as a human race because they are many, but if we look at our condition from a broad perspective, our lives have never been better. The quality of our lives has improved in what just a few years ago were unimaginable ways. People live longer and healthier lives, there is more food and greater access to clean water, and a larger percentage of our world population has been elevated out of poverty. Underlying this has been our access to affordable energy. Affordable energy underpins healthy economic growth, which leads to improved standards of living for all. It is affluent societies that can become more interested in and are better able to invest in improving the environment. We are fortunate to have a vast pool of energy resources and human intellect that will allow us to grow our world economy and, over time, transition to cleaner forms of energy. I joined the NCAC in 2008. I would have joined years before if I had known it existed. Two, among many, things I like about the organization are its lunch meetings and field trips. The lunch topics and speakers are always of interest. The field trips are highly educational and provide access to places that few of us could find our way to on our own. The USAEE trip to the Conowingo hydroelectric generating station on the Susquehanna River in northeastern Maryland stands out. I'll never forget standing deep inside the dam, an arm's length away from the spinning shaft of one of its eleven turbine generators.